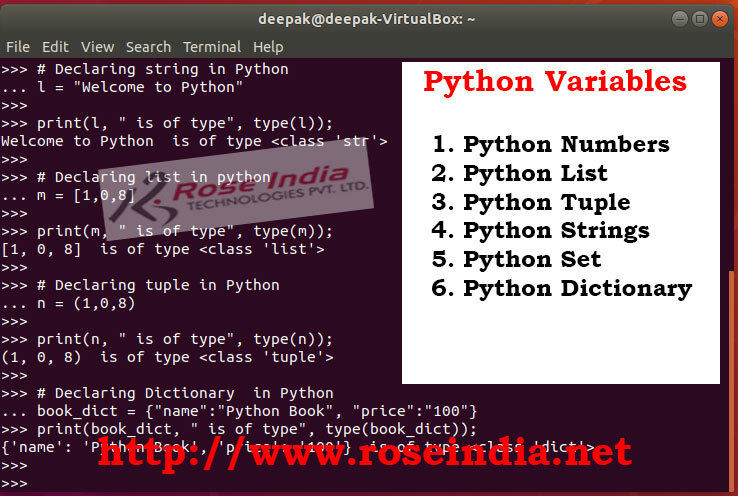 In this section we will learn about variables and data types in Python Programming Language. The variables and data types are essential topics in Python programming language. Programmers should learn to use various data types in Python Programming Language. You should have solid understanding of using various Python data types and its use in creating right variables to meet our business application requirements. In this section we will learn variables and data types of Python Programming language. In this we will be discussing variable and data types in Python in detail. You will find examples of declaring variable of all these data types. This tutorial is for beginner in Python and it gives you detailed introduction to variables and data types in Python with example programs. When you create a variable to store some value in your program (in memory during runtime) then program execution library creates an object in memory and associates a type to the data. So, every data in Python is associated with a type called data type. So, every data in Python is associated with a type called data type and it is determined automatically when data is assigned to it first time. Once the data is assigned and à data type is associated it is available for use in the program. You can't assign a different kind of data to a variable. For example if variable is of int type then you can't assign a string data to it. In the above program we have declared integer type variable in Python by assigning int value to it. Then in our program we have printed the value and type of variable. The type() function is used in Python to print the type of a variable. The Python numbers include int, float and complex classes. In Python list represents an ordered sequence of items. The Python Tuple is immutable ordered sequence of items. The Strings in Python is used to store sequence of Unicode characters. Set is used to store Unicode items and it is unordered collection. Python Dictionary is used to store key-value pair data in a Python program. Dictionary is also an unordered collection of items which stores value in key-value pair. Variables are the object of any class or data type which hold the data in while program is executing. This is the memory location to hold the data in program and it has a type associated with it. Python variable name convention follows the naming convention of identifiers. 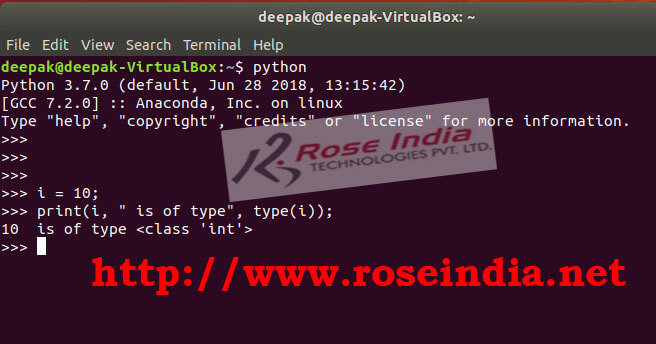 You can check more at https://www.roseindia.net/python/python-keywords-and-identifiers.shtml. In a nutshell you can use any characters (a to z and A to Z) and numbers (0-9) in any combination for naming a variable. It may contain numbers, characters and underscore (_). But the variable name should not start with a number. Variable name can start with underscore (_). l = "Welcome to Python"
... l = "Welcome to Python"
In the above example you learned to define various types of variable in Python.